The planned BioShock movie is apparently stuck in budgetary limbo as producer Gore Verbinski says he's trying to figure out how to keep costs down while staying "true to the core audience." Remember the BioShock film? Take-Two signed a deal with Universal, Gore Verbinski jumped in with both feet, then his feet got cold and he jumped back out... and that was pretty much that. Everything went quiet after Verbinski relinquished the helm to 28 Weeks Later director Juan Carlos Fresnadillo, but the Pirates of the Caribbean man, who stayed on as producer, said he's still trying to make it happen. "We're working trying to make it. 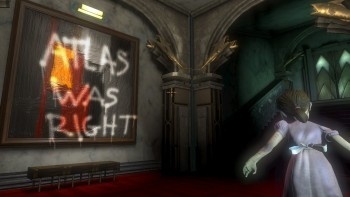 The problem with BioShock was: R-rated movie, underwater, horror. It's a really expensive R-rated movie," he told IGN. "So we're trying to figure out a way working with [director] Juan Carlos [Fresnadillo] to get the budget down and still keep so it's true to the core audience." And he's insistent, at this point at least, on keeping BioShock an R-rated film. "The thing is it has to be R, a hard R," he added. "We don't want to dumb it down, we don't want to make it PG-13. We want to keep it really edgy, and it's a huge bill." Fresnadillo has apparently moved to a new project, Intruders, while the BioShock situation is sorted out, but Verbinski indicated he wasn't interested in retaking the reins if Fresnadillo drops out completely. "We're really down the road with Juan Carlos and right now it's really a budget thing and how to keep the integrity and keep it a Hollywood movie because it could balloon," he explained. "It's a lot. Our first budget was extraordinarily high and we're working on it."